Wolfestone’s relationships with their clients, employees and the communities and environments in which they operate are guided by shared values and ethics which include the principles of corporate responsibility and sustainability. Wolfestone promises to deal responsibly with customers and suppliers. We are honest and open regarding our products and services without hiding anything in the ‘small print’. If any issues arise during the course of a project, or even after it has been completed, Wolfestone will acknowledge the problem and deal with it, keeping the client informed at all times. We treat our suppliers fairly and with the respect that they deserve, being the highly qualified and responsible professionals that they are. Wolfestone understands the environmental impact of our business. We are committed to keeping our local environment visually attractive and free from litter and noise pollution, reduce waste going to landfill and increase reuse, recycling and composting, and to promote more sustainable forms of travel and transport. Wolfestone frequently has a “walk to work week” where it encourages those staff members who are able to, to ditch their cars for a week. The company also donated translation in 2009 for the environmental film of the year ‘The Age of Stupid’. One aspect of the programme is to engage with local schools, colleges and universities to pass on knowledge and insight to students that supplements or is outside of the current curriculum. Themes include promotion of languages, promotion of careers available using languages, encouraging entrepreneurship, inspiring young people, improving interview skills and passing on industry trends to students about to go into the world of work. As well as promoting language learning at University and at pre-University level, the programme offer universities industry input on areas such as translation technology and tools used in the industry. The company also runs a successful internship and work experience scheme, engaging with schools, careers services and the job centre to offer mentoring to increase employability and skills of young people. 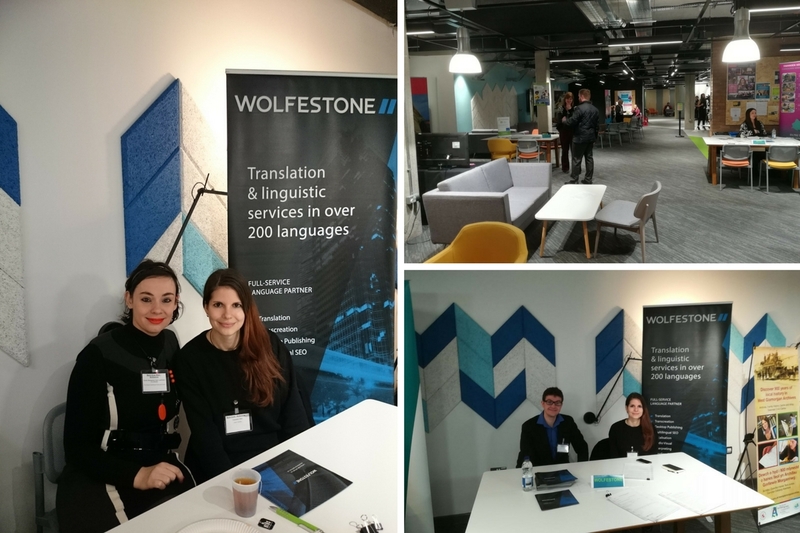 Wolfestone assists Swansea University with its MA Translation course by taking part in the work experience module, where students set up mock translation companies. We also welcome students of both Cardiff and Swansea University for work placements as part of their degree programmes to encourage and assist them in their learning and give them vital experience needed in the world of work. Our commitment to preparing the future generations for the world of work has lead the company to team up with Careers Wales West to participate in a number of work focused activities. Employees of Wolfestone from a range of different departments and levels of seniority regularly visit secondary schools to conduct mock interviews to help prepare students for college/employment interviews. Wolfestone Director, Anna Bastek, is also a Welsh Government Entrepreneurial Dynamo Role Model. The project involves mentoring young people and sharing experiences of entrepreneurship. The project is a key element of the Assembly’s flagship Youth Entrepreneurship Strategy, designed not only to encourage individuals but to offer long term benefits to the Welsh economy. Promoting health and well-being is also one of the company’s core values, to reduce stress and encourage employees to be more positive and we are happy to back any worthy causes. In September 2010, team members ran a half marathon in aid of ‘Help the Heroes’ with Wolfestone matching the money they raised pound for pound. The company also decided to Sponsor the senior and youth teams at local rugby club Briton Ferry. The company has also sponsored Kidsafe, a charity which promotes the well being of children throughout Great Britain and the Republic of Ireland and in 2012 held an event in conjunction with World Food Night aiming to promote diverse cultures and raise money for Refugee Action. Total staff donations were matched by the company, and fundraising was further boosted by a message of support from “Reggae Reggae Sauce” entrepreneur Levi Roots, one of World Food Night’s most prominent supporters.